TUKLAS Innovation Labs, a community-centered innovation project, welcomes Filipinos from all walks of life to submit ideas to better prepare communities for disasters, including ideas to address the impacts of disease outbreaks and armed conflict. Following a countrywide call for ideas, TUKLAS received more than 260 proposals from 17 regions. Through a selection committee process, the lab selected 40 innovation teams that receive training, mentorship and PHP1 million in funding to test their innovations. Each idea is a system, service, product or technology that seeks to benefit communities across the country at risk of disaster to build in protections against disaster-related threats. "TUKLAS is about finding Filipinos, especially the marginalised, who may have found solutions based on experience with disasters but have no one listening to them. Our goal is to encourage girls and boys, women and men, especially those from vulnerable communities, to innovate for their own preparedness." TUKLAS runs innovation labs in four major cities in the Philippines – Baguio City, Quezon City, Tacloban City, and Cotabato City – to support innovators to turn their ideas into viable solutions. The labs also provide co-working spaces and link applicants with experts. 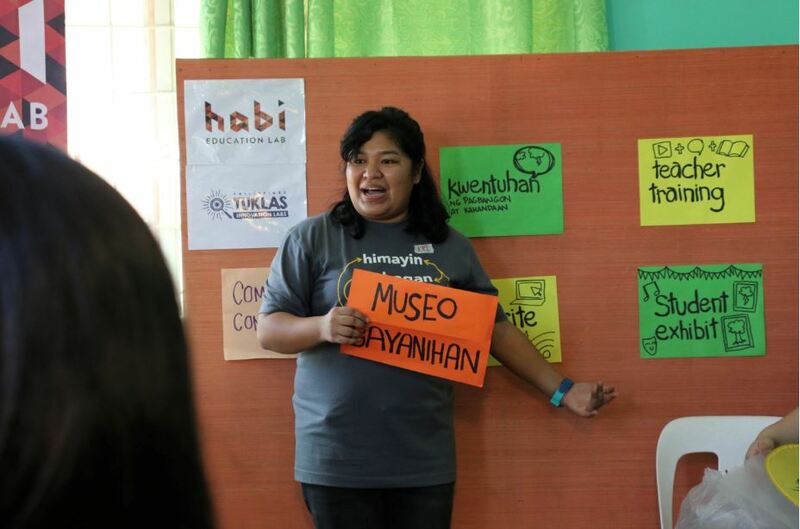 Led by a team of women, MuseoBayanihan is an online learning platform for disaster preparedness. The team will run community-based activities, such as exhibits and workshops to complement the knowledge and tools the platform offers. "Children and their communities are at the centre of our project and we will work with them as co-designers throughout the entire process. We will also use creative thinking and psychology." "Education about disaster risk reduction is new to schools in the Philippines. In far-flung towns like Guiuan, teachers do not have adequate learning materials and support. This is where MuseoBayanihan will contribute."